Since I have been blessed despite the many challenges I have encountered and since I have so many awesome friends, I would like to share the love with all of you. I am doing the BIGGEST and by far the BEST giveaway ever hosted on this blog. Best part, I finally learned to use rafflecopter so it shouldn't be too hard. :) This will start midnight of October 8, 2014 and end on October 24, 2014. Thank you to all sponsors for helping out and making this a possibility. I will pick 7 winners. 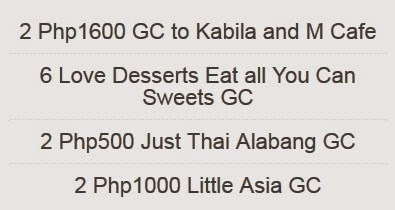 There will be 2 winners of Php1600 each for Kabila and M Cafe, 2 Winners of 3pax Dessert all you can Love Desserts, 1 Winner for Just Thai Alabang, and 2 winners of Php1000 each for Little Asia. Winners must be from Metro Manila only. Winners must be willing to meet with myself to claim prize. Winners will need to respond within a week from announcement or I will draw another winner. Announcement of winners will be on October 30, 2014. Why you should share your celebration because you're kind and most celebrant like to share their blessing to other so that next time there will be more. Bible says " Be a Blessings to Others". Proverbs 19:17.Whoever is kind to the poor lends to the LORD, and he will reward them for what they have done. If ever I win. I will share it also to my family. This is such a welcome treat if I win one of the many GCs your giving away and I sure like to meet you :-) I've been so busy for the past year and I believe I deserve a break and a good one at that. Restaurant GCs are my favorite, hahaha! I love dining out with my family and I guess, it's one of our favorite bonding times -- eating! I still remember the first time that I joined one of your contests but I didn't win. It's ok, this is another chance I'm getting. It's nice to be part of your anniversary celebration. Happy anniversary and more blogs nad giveaways to come. I want to win because I want to treat my Mom using the prize from this giveaway. We've been both busy during these past few days that's why I want to spend a day eating out with her. you should share your celebration with yme because sharing is caring and im gonna use the GC to treat my kids for a good job in school.thank you for the chance! hope you could share your celebration with me.. i will use it on 2nd birthday of my baby..
i'm also going to share it with my bff as a birthday gift. You should share your celebration with me because you'll be happy to know that you made 2 foodies happy. Winning those GCs would put a lasting smile on my Danica's face! why I should share my celebration with you. How will you use it? Hi! I was one of the winners in one of your old contests (overnight stay in View Park Hotel in Tagaytay). My family used the prize to celebrate my 3-year-old son's birthday. It was great to have a place to stay in, after spending a day, going around Tagaytay (fish-feeding and boat-rides in Nuvali, and eating bulalo in Leslie's, and admiring the view of Taal volcano). My son also had a grand time swimming in their hotel pool. We will always remember the happiness we felt during our vacation. We are grateful to you and your blog for playing a big and important role in our family bonding and memories. Thank you! I am joining your raffle again (hehe!) and in case I win, my family will use the prize to create more memories together. I will give it to my mom and dad so they can go on a date on their wedding anniversary.